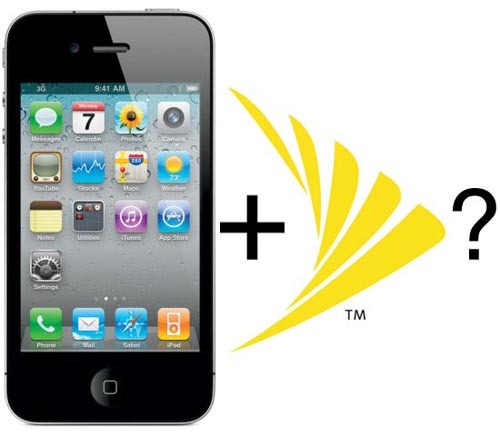 Smartphone Fanatics: Rumor: Is Sprint Talking to Apple About iPhone? Call me a fanboy. Call my a loyalist. But when I find something that works for me, I stick with it. That has been the case with Palm and Palm OS/webOS and it is also true of Apple and Sprint. I've been with Sprint for almost four years now. I've gotten good customer service from them, their coverage is good in my area, and I've become friends with the local Sprint store staff. I've also used Palm's gear for 10+ years now, and Apple's computers since 1984; starting with the Apple ][e.
Now that Apple has built a CDMA/EVDO iPhone for Verizon, the buzz on the Internet is practically deafening about when Sprint might ink a deal with Apple to bring the iPhone to the Now Network. PPCGeeks.com has an interesting article posted from last week asking if history is repeating itself. I'll let them explain. "Everyone noticed when Sprint quit promoting a certain part of their own EVO commercial on TV, which had one quote that stated "the EVO was a superior option to the iPhone 4". Recently, Sprint altered this commercial to remove the iPhone 4 quote entirely. What beatweek noticed, and what we find interesting as well, is the fact that history seems to be repeating itself. Remember when Verizon had comments about the iPhone, barely a year ago, and then they eventually pulled this commercial, with no explanation, from the TV commercials? Well, Sprint is now doing the same thing." Interesting. I'd like to think that now that the CDMA iPhone hardware exists, Sprint is talking with Apple. I'd like to stay with Sprint, but with my 2-year contact for my Palm Pre set to expire in four months, I'm willing to jump to "Big Red" to get a pair of iPhones for my wife and I. Either way, it looks like I'm ready to take a break from HP/Palm webOS devices. I don't see why Apple would go to Spring given that Spring has committed to WiMax for their 4G technology when everyone else is going LTE. Why would Apple make a deal with a company for a year or two (while CDMA is still viable) but then have to drop because of an incompatible next-gen network? Hey, don't do it!!! Sprint/Palm is coming out with an all touch screen for palm!!! I have the Pixi (love it) and though I hate all touch, I'm excited to see it :) Should be here this summer!! Hopefully they hook up with droid! !